Astaxanthin - anyone hear of it, or use it? """...consuming the supplement for two weeks significantly increased the duration of ultraviolet light exposure required to create sunburn.""" I have read on some other sites claims of enhanced skin health as well and was wondering if anyone has any long term antecdotal evidence that it indeed works as a sunscreen. It is also said to be antiinflammatory, enhance joint health, increase endurance of physical activity and recovery afterwards, AND encourage apoptosis. That is a pretty stout list of claims. Doseage is 2-4mg per day, but some people contend that the necessary dosage may be higher than that...maybe along the lines of 12-16mg, in a divided dose throughout the day. I am testing out 8 mg per day and it is supposed to take 30 days or so of use to see results. We'll see. Interesting supplement..had never heard of it but was looking into using Krill as a source as a new and better source for omega 3 supplementation and I guess krill have quite a bit Astaxanthin. I wonder if these will improve AK. 2 mos. post mohs & flap graft reconstruct to fix a hole from a BCC in the tip and it look like there are a few AKs on nose. I have been taking the astaxanthin now for two months. I really can't give a conclusive thumbs up or down as of yet. I do try and get 15-20 minutes of unprotected sun exposure as many days as I can (except on my face). I wish that I had a way to quantify any benefit that the astaxanthin might be affording me, but that length of sun exposure isn't going to do much burning, or tanning, anyway. So, I can't say that it is keeping me from getting burned. As far as other benefits, maybe a slight muscle recovery benefit noticed post treadmill use, but that is very subjective as well. But, I have been taking only 8 mg of the stuff per day and have seen that maybe twice that amount is a better dosage. Have you noticed that your skin is less dry or that it looks better apart from the sunburn aspect? The link above was interesting but sometimes I wonder about these because they seems so much like a sales pitch and 1/10 of the claims would be amazing. However he gives a link to google scholar which has some studies in it. Not specifically since I have been taking the astaxanthin. I did notice a difference back a couple of years ago when I started supplementing with higher doses of fish oil and, I think more importantly, switched away from harsh commercial soaps. I now use only castile soaps (I use Dr Bronner's). I have some positive feedback for astaxanthin after this weekend. I was out doing some gardening and mowing for an extended time this weekend, and did NOT put on any sunscreen. I stayed out without a shirt on a lot longer than I intended. I had planned on putting on my L.L. Bean SPF 50 long-sleeved shirt after about a half hour and got carried away in my activities and forgot to watch the time. Anyway, I had full exposure for maybe an hour. Normally I would show redness in that length of time (especially since I don't do any sun worshiping anymore) and also a fair bit of tanning by the next day. Taking a shower that night, there was no indication of burning at all. Push the skin, no tell-tale white-turning-to-pink of a sunburn. Maybe astaxanthin really is an effective oral sunscreen. I'll stiull try and be more cautious in the future though. I had bought Solaray astaxanthin and re-read the package and it is only 1 mg per pill! Has 10 mg of H. pluvalis extract - 85% astaxanthin, other carotenoids, lutein, cantaxanthin, beta carotene. What kind did you buy Rocco? Perhaps I should get one with more astaxanthin?! Derma e makes a topical skin cream with this also. I tried to find it on the shelf at a couple places today and struck out - guess i will have to order this. Thanks again Rocco - it's always good know someone has tried this and lived - hahahaha! ""What kind did you buy""
I am currently using BioAstin, Natural Astaxanthin Supreme. Other parts of the label say MD Formulas Hawaii and Nutrex Hawaii. I am not exactly sure which one is the manufacturer name. It is a 6 mg dose. I like this particular one because astaxanthin is a fat soluble molecule and is supposed to be taken with a little fatty acid, and this product includes as part of the dosage 400mg of extra virgin olive oil and some vit E.
""it's always good know someone has tried this and lived""
Guinea pigs are handy, aren't they? I always start out slowly with any new supplement. Some day I may move up to 12mg a day, but 6mg is fine for now. Here is a link to a booklet which contains basically everything you'd ever want to know about astaxanthin. It was published by the manufacturer of the stuff in Hawaii. The parts regarding using it as a sunscreen start about page 50. Here's my little report on astaxanthin. I have been taking Vitamin Shoppe brand 4mg/day for about 4 months now and give it a thumbs up. Even at this low dose, I have noticed increased energy, better endurance during exercise, and greater resistance to sunburns (maybe 2X). I remember that I took my first dose in the evening-- bad idea, hardly slept at all that night. Now that I take it in the morning there is no caffeine like buzz. In addition to cardiovascular enhancement, astaxanthin also has impressive anticancer properties. Astaxanthin, a carotenoid without vitamin A activity, may exert antitumor activity through the enhancement of immune responses. Please read up on side effects/drug interactions. I don't take any prescription drugs, but I've read that Astaxanthin can cause problems. I take one pill, 4mg. proprietary name Zanthin because it's all natural, once a day just before a meal. If I take it after a meal it burps a lot. I think it may also hinder sleep if taken in the evening. I read than you can safely double the dose, but if you saw my photos, I didn't want to double the dose. Dr. Mercola preaches about it. Well I started taking astaxanthin about three weeks ago and yep things are popping up all over...Oh Goody!... No actually Oh Goody!..with the end result in mind I'm cool with where this is going. I have a ton of AK damage on my face and several BCC's including a huge one (in my mind) that is on my forehead @ 1/1/4" long 1 wide. Big ol daddy with a huge crater from some of the "softer" but not completely effective ways I've been trying to knock it out. Being one of the first bloodroot advocates here I have been trying and trying and trying various "softer gentler ways to knock these BCC's out with some success...Along the way I have definitely held back and maintained the Ak's some completely gone many reduced..but one on my forehead..a neighbor to the big BCC was the litmus test benchmark..I say it was the benchmark.. Because if I could knock it out then I had a winner..though I had slowed them all down I could not get this one to even get close to going away..Lets see orange oil, eggplant, vinegar, Iodine and a litany of various concoctions.. Mind you this was just a very resistant AK but I have never been able to get it to go away.. The way I knew it was still there was by pushing on the area where it was.. if it hurt it was still there..I'm talking at least 4 years messing with this one. For sure it is gone....a little dent where it was and no pain..
My question is would it have gotten knocked out if I wasn't taking the astaxanthin. I've been on the astaxanthin about 3 weeks now and plan to supplement with it the rest of my life. I didn't have the explosion Thomas had but I also have been beating these AK's up every day for years with a variety of concoctions.. Vitamin C crystals and or ascorbic acid mixed in with various face creams every day and a ton of other things including vinegar which does help hold them at bay... I had them up against the ropes just couldn't get the knock out.. I think Astaxanthin is the silver bullet for AK's of which is where most BCC's originate. Knock out the Ak's and I believe you are going reduce the number of BCC's substantially. Will keep you updated.. I am trying some other things to kill the big BCC and several other smaller BCC's I have... I'm reserving saying exactly what I am doing until I am sure I have genuine "DOCUMENTED" success.. I was one of the many people here grinding up eggplant and vinegar and rubbing it all over making a useless mess based on a poster here's over zealous enthusiasm about a recipe that in the end did not work for anyone that tried it. Don't want to repeat that scenario. I can definitely say things are looking promising. Anivoc, glad to hear the Astaxanthin is working for you. I'm not certain of this but from what I've read, I've formed the hypothesis that if your immune system is already doing well and not suffering too many insults (smoking, bad diet, you know) then the Astaxanthin is able to up-regulate the system to go after some of the baddies. To me it means the immune system is well tuned up, maybe not at the highest peak performance but getting up there. A minor nitpick of no real consequence: a while back I made the same mistake of writing that AKs can turn into BCCs, but actually AKs can turn into Squamous Cell Carcinomas. Gosh, maybe it's me that's backwards on that, if so, give me a razzberry. Please look after yourself as much as you possibly can; with all the skin cancers you have to fight, your immune system must be working overtime. Re: Squamous or Basal and Ak's preceding..originally it was thought only squamous, not so anymore.. they've found either can spring up from an AK and I'll take the BCC's if I get a choice.. I'm a mess right now ,,OY! anivoc, are you getting swelling, redness/erythema at the sites? Mine was then followed by severe flaking as those dead baddy cells worked their way to the surface. It looks very similar to what happens when you get a minor burn. As I understand it, that's a typical reaction when the immune system has been mobilized and attacks. Just like those prescription topicals that have a similar mechanism of action. You betchya! Not as bad as in your pictures but yeah swelling up in places I thought were no big deal.. Not as bad where I have been hitting topically for years.. I was thinking about it today basically in the past just hitting the obvious trouble spots topically did get results but just slightly shrinking / holding them at bay. Hitting them internally and topically whew!.. I'm holding off on the topicals on the AK's for a few days because OUCH!.. I am excited about all the AK's getting handled and a big thanks to you Thomas for being a guinea pig and then posting pictures and thorough report.. would not have tried the astaxanthin otherwise. If I get the same end results I think it is a no brainer that we need to encourage this protocol for dealing with AK's. BTW I live in Covina..Anivoc in a mirror.. we should hook up sometime and exchange war stories. Anivoc-Covina! All this time I've been wondering. If you drive north on I-5 I'm at the top of the Grapevine pass. Please refresh my memory - do you have a slideshow on YouTube with your photos? Do you plan to post more photos? I was having a battle about bloodroot salves with some pscientists on an Amazon cancer forum so I posted some YouTube links with photos of various people who had success with bloodroot, and also a guy who demonstrated that bloodroot on non-diseased skin leaves the skin undamaged. They of course believe the photos were rigged because they believe all black salves are corrosive and will damage healthy skin. *pscience - pseudo-science, phony science, partial science, anyone claiming to adhere to scientific principles but prone to pre-judging. I put my pictures up on the net long before there was a youtube @ 2002. BTW the first thing I did and always recommend everybody do is do the 24 hour test on an area you know is not skin cancer. I did it on the inside of my upper thigh where "the sun don't shine" I placed a little dab on my leg, covered it with a bandage and waited. 24 hours later no effect.. maybe slightly a little pink but nothing like what happens when you put it on a BCC.. Where talking day and night reaction. Put it on my first skin cancer that next day and in about 2 minutes.. baby there was something going on quite like never before.. In the pictures both the forehead ones came back. I retreated the one on my right side of my head with Bloodroot and it is pretty much under control.. I tried RF therapy on the one on my left side... no bueno ..it is way big so I'm doing the softer gentler thing..
What is REALLY cool is the one on my nose, which was the smallest healed up very nicely and 11 years later has never come back..YEAH! I guess it has been almost 3 years of taking 4mg of astaxanthin nearly every day for me. I just wanted to say all is well for that time span. I'm not sure how much to credit astaxanthin but thankfully it seems like my immune system is now capable enough to deal with any skin issues that come up. Another combo that seemed to noticeably help my skin is vitamin D (3000IU/ day) and vitamin K2 (Life Extension Super K). Dan, thanks for the info. I recently upped my D intake even though I get a pretty good tan from working outdoors 8-10:00AM and/or 2-4:00PM most days. Something about our latitude in the States. I just got some K2 because, was it you who put up the info a long time back about K2 and some prescription drug for blood pressure and how well it worked? Mercola also likes it ... Anyways after looking into it the research seemed sound. My progress had slowed for quite a while, very slow rate of improvement after such huge gains. Now with a new topical it seems to be speeding up. Like Anivoc I'll wait and see before discussing it. I was wondering if you had continued to use astaxanthin to the current date and if it had continued to help with the shedding of AK's and BCC's. After reading many correspondence on this site I treated a biopsied BCC with petty spurge and believe that it is on its way out right now.Also I am 3 weeks into CARAC on the face. I am not the most patient person and was really suffering the pain of a really intense reaction to the 5 fu cream. After researching many medical sights I had read about [in their terms INCREDIBLE RESULTS]when combining astaxanthin high dosage with5 fu treatments. So after reading your posts I decided to combine ATX 16mg daily with CARAC. So far 3 days in the redness has diminished pain has almost gone and more AK's are lit up with just a small area of redness around them. Some of them are just brushing off the skin this morning.At first I thought I had really screwed up but I was treating a few AK's on my arms with PS and it seems that the reaction is more advanced in a shorter time period than previously treated AK's that disappeared with PS treatment.I dont recommend this to other people but so far it looks pretty promising if it can take away the discomfort of 5 fu creams. One thing is that I did not start with the ATX till day 16 when the pain was intense.. I am pretty sure Astaxanthin is part of Dan's daily regime of supplements but he'll need to confirm..I have opted to use it daily ...I had a less severe experience than Thomas but definitely had some things pop up when I started that has since calmed down. If just for the helping reduce sunburn, I'll use this onward daily..the fact that it caused a reaction to sun damaged skin and now that skin seems healthier is also enough for me to keep it in my daily arsenal of supplements. Newroof, I too am continuing the astaxanthin but results are now much less pronounced and slower in showing. I'm almost free of spots, killed all the easy ones and NO new ones, which is a relief in itself. I take a break from astaxanthin to let my skin color return to a more normal tone. You know the salmon and lobsters are bright red, and my worst areas stayed red for some time. Small price to pay. Anivoc, have you posted about your topical regimen to let us know if it was worth trying? I stopped my topicals when my circumstances changed and the public was staring at my paste treatment, so I'm not sure whether it would have succeeded on my oldest BCCs. Instead I'm using a huge variety of supplements with some progress but unfortunately I'll never know which of them is doing the job. Yes like you I am facing a similar dilemma with my topical concoction. I keep them covered with micropore tape but the two on my forehead stand out like a sore thumb. I am in a sales position that though more often than not is not face to face, it does require some face to face and it is messing with my head ( no pun intended ) when I meet with a hew client and have to explain the tape..very obvious and needs explaining. My conclusion is that I would not recommend what I am doing because it is so slow and painful...I have made progress is shrinking and eating away at some large Nodular BCC's but I am pretty certain I am not going to get the total kill...Too much pain to endure for too long without. I'm going to give the internal quercitin Vit C regime a try while continuing on with ny experiment to see if combined I can get overcome these lesions. BTW how astaxanthin are you taking daily? Costco now sells a Truenature brand that contains 6 mg in each capsule...I am taking one a day..
Anivoc, I use 4mg a day which gives sunburn protection. I don't feel I need more - my immune system is already revved up as evidenced by the fact I have not even had so much as a cold in the last 5 years. I'm taking so many other supplements and herbs right now and getting some progress, so I'll stick with this regimen a while. Thanks very much for the input it helps a great deal. I approached this with first getting as healthy as possible and doing a little bodybuilding regime that has really helped in teaching me how the body functions and reacts, as well as how to keep a really clean diet and what all the aminos and supplements can and can't do.I first saw ATX being used by ironman contenders and then I see it present in so many supplements now. I did find medical reports of using ATX with 5 fu with great results of tumor eradication in breast and colon cancer and other chemotherapy drugs combined with high dosage anti oxidants also being a better result than chemo alone but unable to find something specific to skin cancer. Like in b-building perhaps ATX is best cycled between low and intermediate dosages to stop the body becoming resistant to it..? Perhaps stopping completely at times and using fern block during these periods.. I hadn't considered the beautiful pink glow i'll have as well. My daughter will be thrilled. well still. Only time will tell. Newroof, you wrote "perhaps ATX is best cycled between low and intermediate dosages to stop the body becoming resistant to it..?" I don't think so. This stuff is an antioxidant and my vague knowledge is the body will always continue to benefit from antioxidants as they help at the cellular level. Whether cancer cells somehow react to Astaxanthin and sidestep the immune system response, I have never read anything to that effect. I believe cancer cells are sneaky and can use several methods to dodge the normal body processes that would eliminate defective cells. Our search is always to find those interventions that unmask and expose cancer cells to our own killer cells. Hi Thomas It is early days for me so i am developing a knowledge as i go. I have learnt from the b-building that the body often requires change to keep nutrients working as they did initially, but this is a new scenario that I am dealing with now.. I had also listened to a micologist [Paul Stamets] I believe talk about how he uses Turkey Tail mushroom to combat cancer very effectively. He described that it was it's ability to unmask the cancer cells and expose them to our own immune system that made it so effective.. This I keep in reserve and will also give it a try when other things seem not to work..
Hi newroof, looking at my post from a year ago really nothing has changed, which is a good thing. I still take astaxanthin every day so that is about 4 years now. For the past couple of months, I added homemade lipsomal vitamin C (water, lecithin, and ascorbic acid mixed in an ultrasonic cleaner) due to lots of hype on the internet. I'm still not sure what to think of it but I feel it is maybe removing mercury and the choline in the lecithin is kind of calming, so I will keep going for a while. Here's a recipe I found on the net..
Vitamin C is the most used supplement in the world. There is good reason for this as the science behind the many benefits of vitamin C is solid. Dr. Svent Gyorgi and Dr. Linus Pauling performed innumerable experiments proving that man, unlike most animals, is dependent upon vitamin C for a healthy existence. For decades we have relied upon various ascorbic formulas for our supplemental needs, but now a whole new vista opens up with Liposomal technology. Increase Absorption Dramatically - Regular vitamin C is absorbed at approximately 19%, the balance remains in the gastrointestinal tract to attract water and loosen the bowels. Nanotechnology, liposomalized vitamin C is absorbed at 93%, measurable in the blood stream. A 390% increase in absorption! Get IV results with oral dosage! Heat one cup of distilled water in a ceramic coated or stainless steel pan on your stove (do not heat it in a microwave oven) until almost boiling. Pour the water into your blender and add three level tablespoons of lecithin and blend until all of the lecithin is totally dissolved in the water. In one cup of cold distilled water, dissolve one level tablespoon of ascorbic acid. Make sure it is totally dissolved, very important! Add the ascorbic acid mixture to the lecithin mixture and blend well. Pour the mixture into the ultrasonic cleaner and turn it on. Stir frequently. The cleaner will turn itself off about every two minutes or so. You continue to stir frequently and turn the cleaner back on until ALL of the foam is gone. Repeat: Continue to stir and turn the cleaner back on until ALL OF THE FOAM IS GONE!! This will take about 30 minutes or so. When done you will have a mix that is about the color of milk. There will be some settling but shouldn't be much, less than 5% of the mix or so. When done, pour mix into a reseal able GLASS jar and store in your refrigerator. Take one teaspoon full of mix once a day. You can experiment with this amount after you have taken it for awhile to see how it effects you. Take on an empty stomach and wait at least 15 minutes before eating anything. Many take it in the morning before breakfast. It is really sour tasting so many chase it with water to get the taste out of the mouth. Creating an identical pH in your liposomal brew is simply a matter of carefully adjusting the level of bicarbonate of soda. This Vitamin C Ascorbate recipe is a compilation of several postings on forums and Pdazzler�s own trials in the kitchen. 1. In qt mixing jar pour 1 cup of distilled water. Add 3 level Tablespoons of granular soy lecithin (NOW has non-genetically modified soy lecithin) and agitate vigorously for 3 � 5 minutes. Then place the lecithin mixture in the refrigerator for two or more hours. (You can leave in refrigerator overnight if you prefer.) This allows lecithin granules to soak up water for easy mixing into solution. Note: Mixing can be accomplished easier if you raise the temperature of the distilled water being used to 45 degrees Celsius (113 degrees Fahrenheit). I have found this unnecessary in getting high quality mixtures but others have found this warmer temperature helpful. After 2 hour soaking period vigorously agitate the mixture for another 3 � 5 minutes. At the conclusion there should be no lecithin granules visible. Set this smooth lecithin mixture aside. 2. Dissolved 1 level Tablespoon of Pharmaceutical grade Vitamin C powder in 2 oz. of distilled water. We recommend you use a 6 oz. or larger screw lid jar so you can shake vigorously. 3. Dissolve 1 Heaping Tablespoon of Bob�s Red Mill Bicarbonate of Soda (Bob�s is Aluminum free) in 2 oz. of distilled water using a separate 6 oz. or larger screw lid jar. Shake or agitate the mixture 3 minutes or until soda dissolved. *One mole of sodium bicarbonate is 84 grams, and one mole of ascorbic acid is 176 grams. So, the correct (stoichiometric) ratio of sodium bicarbonate to ascorbic acid is 84/176 = 0.477. For example, it would take 477 milligrams of sodium bicarbonate to neutralize 1000 milligrams of ascorbic acid. **What follows is often the most difficult part of the process for those new to making homemade liposomal Vitamin C Ascorbate. At the conclusion of mixing the bicarbonate of soda mixture into the Vitamin C mixture all bubbling will cease. If you have any soda settled in the jar pour the resulting total mix together into that jar, swirl and pour the resulting Vitamin C / Bicarbonate of Soda mixture into the Ultrasonic Cleaner. 4. Pour the Lecithin solution into ultrasonic cleaner bowl with the Vitamin C / Bicarbonate of Soda mixture and stir the contents together. 5. Turn the ultrasonic cleaner on and using a plastic straw (leaving the top of the cleaner opened), gently, slowly, stirred the contents. Note: The cleaner will, automatically, self-stop about every 2 minutes. Just push ON button to continue. Repeat for a total of 6 series (12 � 18 minutes). By that time the entire solution should be blended into a cloudy, homogeneous, milk-like mixture. The LET solution is now well formed. You can raise the level of encapsulation by continuing several more ultrasonic cycles if desired. This protocol furnishes 12 grams (12000mg.) of Vitamin C Ascorbate. At an estimated/theoretical 70% � 90% encapsulation efficiency, 8400 mg would be of the LET type. This solution will keep, acceptably, at room temperature for 3 to 4 days. Refrigerated, it will keep much longer. Note: A larger, more powerful, ultrasonic cleaner is available at Harbor Freight. Item number 91593. 2+ liters, for about $80.00. Both units perform well. The larger unit will allow you to make higher quality liposomal or more encapsulated supplement at one time, depending on the amount you mix. This article was written and submitted by an anonymous Australian researcher and this method has yielded excellent results everytime we have use it. For informational and educational purposes only. Void where prohibited. I put 4 tablespoons of Vitamin Shoppe non-GMO lecithin granules in a clean coffee grinder. Once ground, I add that powder to warmed Brita filtered water in a clean coconut oil jar, shake, and let stand for a few minutes. Then I add the lecithin and water to the $30 Harbor Freight ultrasonic cleaner for a three minute cycle. After that I add 4 teaspoons of Vitamin Shoppe C-1000 Powder (ascorbic acid), stir, and run the ultrasonic cleaner for 5 three minute cycles. One tablespoon = 15 ml = 3 teaspoons. The hardest part is pouring the mixture back into the coconut oil jar from the ultrasonic cleaner. It is still a bit foamy but there is not much settling overnight. I store it in the fridge. The whole thing takes about 25 minutes to make. I am using it and the little AKs are flaking off, where before not much was happening. I've been using Astaxanthin for a few days now, while I wait for the petty spurge to come in the mail or for my own plants to grow, thanks for the info. I don't think so. This stuff is an antioxidant and my vague knowledge is the body will always continue to benefit from antioxidants as they help at the cellular level. Whether cancer cells somehow react to and sidestep the immune system response, I have never read anything to that effect. I believe cancer cells are sneaky and can use several methods to dodge the normal body processes that would eliminate defective cells. Our search is always to find those interventions that unmask and expose cancer cells to our own killer cells. Casun, that's a great reaction, looks horrible but later it will feel so good to kill off so many aberrant cells. Please give us some "after" photos of the same area. Already looking better, after picture, later. I put some grapefruit seed extract and cotton on the big one and when I pulled the cotton off, most of the Eschar came off clean but now it looks yellow, so I guess it's a little infected. I guess I'll have to do without the petty spurge that never got here. I use apple cider vinegar and balm of Gilead, for dryness. I go to the dermatologist PA, on August 1st and if they don't start treating at least some of these or give me an appointment with a surgeon. I'm not going back there again. My doctor said Liquid Nitrogen treatments could cause more damage. I did that for 20 years. I also am using Wild Oregano Oil, internally and externally with olive oil and Nuke Protect. I will also try petty spurge sap, when my plants get bigger. I have been taking bioastin 4mg one a day for over a year now and have noticed that I don't get upper respiratory infections any more and I have more energy. Initially, it gave me some palpitations, mild fever, and low back pain, but I stopped it for few weeks and the side effects disappeared. I restarted again and didn't have repeat of those side effects. 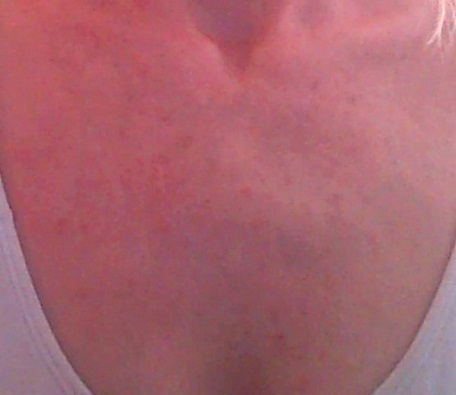 However, in the past few months, I have noticed tiny brown spots starting to appear throughout by body, more so on the shoulders, arms and hands. Some are light and others darker brown. I used to freak about the few moles that I had and now I'm in full anxiety. I know astaxanthin can cause skin coloring issues, and so could these brown spots be due to astaxanthin? I read somewhere that astaxanthin caused a brown patch on a face which disappeared few months later and new healthy skin was revealed. Has anyone had a similar experience. Hopefully someone will answer. Thanks. shantastic, I'm now three years into 4 mg ATX daily and have only had one brown patch that was enlarging before I started ATX. My dermatologist said it was age-related thickening of the skin, unsightly but nothing to worry about. After some months of ATX use the brown patch peeled off and showed healthy skin underneath. No recurrence. That's all I know about brown spots. Red areas gradually fade. Thanks Tom for the info. Mine are tiny-dot brown spots, not a patch, and they're appearing throughout my body. I have stopped the astaxanthin, it'll be 6 days now, to see if that's the culprit. I can tell the difference without it: less energy, aches and pains, and already started sneezing. I just don't know how to proceed with this: to take or not to take. On another forum, someone gave a warning that not enough studies have been done and no one knows for sure about it's long term effects on the body, and so to be cautious, perhaps it's best to take the lowest dosage and take it every other day and take a week break each month. shantastic, If I remember correctly, some or all parts of the ATX are stored in the fat, which to me means it's like a reservoir that gradually fills and gradually empties, not used up in a day or so. Thus it can take a while to decrease if you stop taking it. The skin is where many toxins are stored, since the skin sheds and thereby expels some of the toxins (heavy metals? poisons?) In that way the body protects itself as well as it can from these exposures. Could it be that your brown spots are part of this process? The ATX may be accelerating this function. I hope that's the case Tom, because it's freaking me up. It's not just one patch or dot, but several and increasing. I have to see a dermatologist for the peace of my mind. Thanks for the reply. 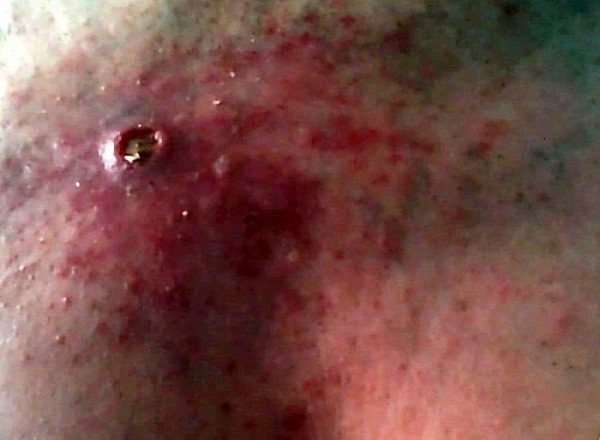 shantastic, not to invade your privacy, but if you don't mind, please let us know the MD's diagnosis.